A body wearing a life vest was discovered in the search for a man and his three teenage children who went missing during a sailing trip off the western coast of Florida, the Coast Guard said Wednesday. 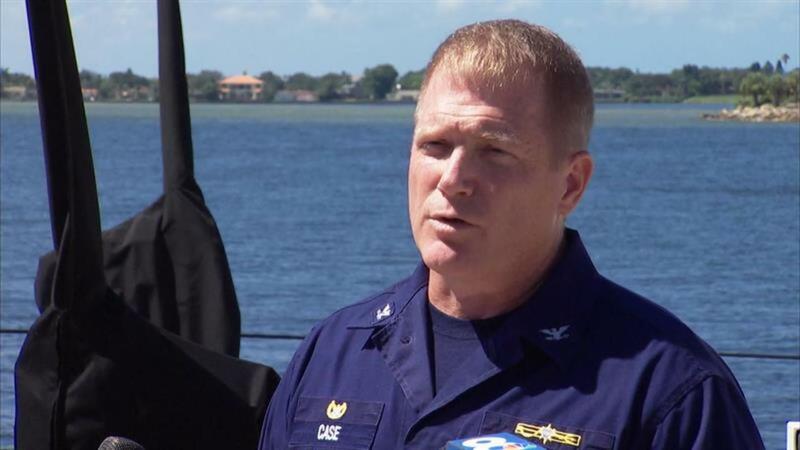 "I would like to point out that this is still an ongoing search and rescue," Coast Guard Sector Commander Gregory Case told reporters Wednesday evening. "And we still have three persons out there that we're trying desperately to locate, and we still have hope for that." The body was spotted at by a helicopter at around 4:30 p.m., Case said. It was recovered and a positive identification is pending, he said. Case did not release more details. Ace Kimberly and his two sons and daughters were aboard a 29-foot sailboat on a trip from Sarasota to Fort Myers Sunday when they encountered 6-foot seas, officials said. A search was launched Tuesday, and officials made the disheartening discoveryearlier Wednesday of life jackets and debris as well as two kayaks that the sailboat was towing. Kimberly and his children, Becky, 17, Donnie, 15, and Roger, 13, were aboard the vessel. Six life vests have been found, officials said. Kimberly's brother told authorities he believed seven life vests were on board but officials aren't sure if there may have been more aboard, Case said. No distress call was issued. There were "squalls, or typical thunderstorms," going across the area when the boat vanished, Case said.